Posh full-back Michael Smith has been called-up to a Northern Ireland squad. Photo: Joe Dent/theposh.com. Peterborough United players Michael Smith, Gaby Zakuani and Kgosi Ntlhe have received international call-ups. Right-back Smith has a good chance of winning his first senior Northern Ireland cap in friendlies against Wales in Cardiff on March 24 and Solvenia in Belfast on March 28. If Smith performs well he will have a chance of forcing his way into Ireland’s squad for the 2016 Euros. Posh centre-back Gaby Zakuani has been called up to DR Congo international squad. His chances of appearing at the Euros have increased recently as Chris Brunt has been ruled out of the summer tournament because of injury. Brunt has been playing left-back for Northern Ireland, a position Smith has played in for Posh recently. Smith (27) said: “I am delighted to have been called up to the senior squad for the first time, it is what you dream of as a young lad. Former Posh striker Conor Washington is also in that Northern Ireland squad. It’s understood Posh receive an additional fee from QPR if Washington makes his international debut as part of the £2.5 million transfer deal that took him to Loftus Road in January. Left-back Ntlhe is in a South African Under 23 squad to tackle Brazil in a prestgious friendly in the Rei Pele Stadium in Maceio, Brazil on March 27. And central defender Zakuani has been picked for DR Congo’s home and away African Cup of Nation qualifiers on March 26 & 28. All three will miss the Posh League One home match with Coventry City on Good Friday (March 25). That game will be shown live on Sky television for which Posh receive a fee of around £80,000. 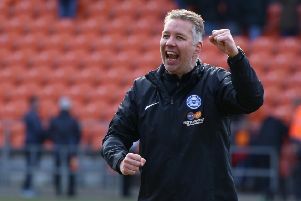 Posh have postponed their scheduled League One fixture at Fleetwood on Easter Monday (March 28). This match will now take place on Tuesday, April 5. Midfielder Chris Forrester has been named in a provisional Republic of Ireland squad for Easter friendlies against Switzerland on March 25 and Slovakia on March 29. He will also be unavailable for the Coventry game if he survives when the squad is cut down later this week.